We are committed to making sure everyone can enjoy Great & Tiny War, whatever their access needs. 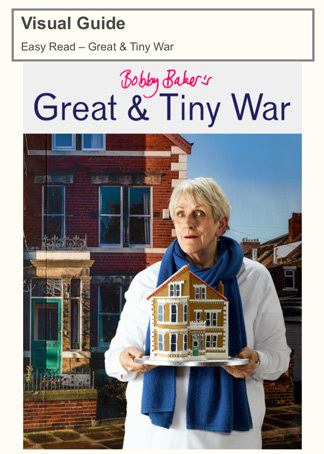 Great & Tiny War is set in an ordinary terraced house that we're renting just for a short period. For this reason, we can't adapt it for wheelchair access but we have taken steps to make sure that wheelchair users, or anyone who doesn’t feel able to climb the stairs, can still access the work. As each visit slot is for a maximum of 4 people, we are aiming to create a bespoke experience that will also meet any additional requirements you share with us beforehand or when you book. We've been putting a range of access options and information in place, including getting to and into the house, and parking options. Our Easy Read Visual Story Guide is available to download here, and copies are available in the house. We have a captioned video tour for those unable to access upstairs. We also have an audio-described version of the installation. We can book BSL tours on request. Please get in touch if you'd like further information. If you have other requests or requirements that you think we can help you with, whatever they are, you are very welcome to get in touch - by email, phone or text on 07535 008875. We'll do everything we can to make it work for you. 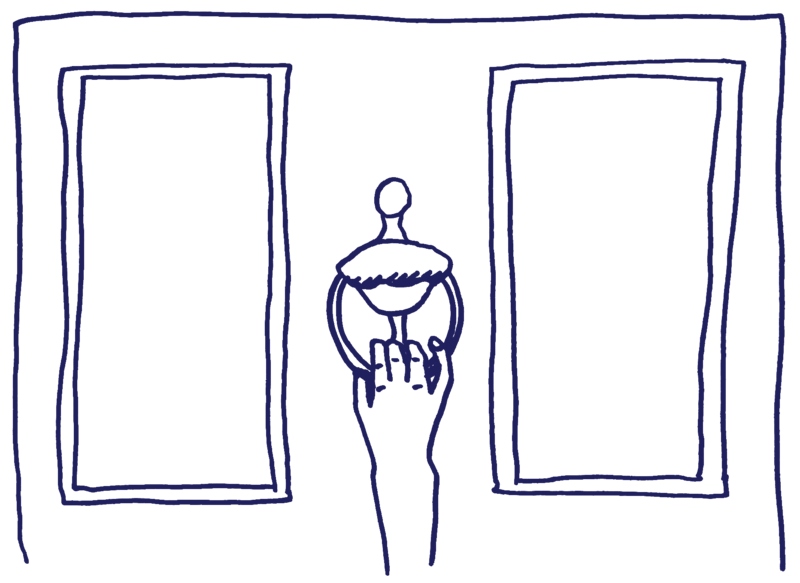 It is possible for a wheelchair user to enter the house from the front door or the back - both have ramped access. However there is no parking or drop off at the front. Instead, cars can drive up the back lane and drop off directly outside the back yard door to the house. Please let us know when you book that you will arrive at the back. There will be a signage and a doorbell making this entrance clear. We don’t have a dedicated parking space outside the house. There is no parking available on the street. If you use the back lane, you can park there if you have access needs but please ensure you don't block the lane for other cars. Alternative parking, included disabled bays, are available a short distance from the house - they are marked on the map below. The house has one toilet upstairs. It is in a separate, small room next to the bathroom, where the handwash basin is located. We also have a basic accessible toilet located in the yard of the house. Alternative facilities are available at the Nunsmoor Centre 200 metres away. Although we don't have dedicated changing facilities onsite, baby changing is possible in the upstairs bathroom. For adults, the closest facility is at the Nunsmoor Centre 200 metres away, marked on the map above. All carers are welcome to accompany you on a visit free of charge. We do need to know numbers so we can make sure not to go over capacity in the small house so please select the carer option when you book. We have an audio described version of the audio guide for blind and partially sighted audiences. If you may need assistance with navigating the house, please let us know when you book so we can make sure to have someone on hand to help you. BSL, captioning and hearing loop. We have a number of options to support you if you are d/Deaf or hard of hearing. Our video tour of the house is captioned. You are welcome to watch this in the tea room, or to take an iPad with you as you tour the house. We have typed transcript of the audio guide you can take around with you. You can choose to listen on headphones or on a portable loudspeaker. If you would like to use the loudspeaker, please contact us in advance so we can make sure your whole group is happy to listen in that way, or we can book a tour just for you and your party. We have a portable hearing loop device that can be carried around on the tour. It is this model. As each tour is for a small group, we are offering to arrange BSL tours on request. We have an easy-read guide available for anyone who will find these helpful. It includes a map of the layout of the house and simple information about what to expect before and during your visit. You can read it online or download a copy here and our hosts will be able to provide printed copies on arrival. All house visits are in small groups of up to 4 people so we don't expect the visit experience to be crowded or noisy, but there may be a number of overlapping groups in the house, and they will cross paths in the tearoom too. If you have particular sensory needs or requirements, or if you will be bringing a small baby or toddler, or would like a slot all to yourself for whatever reason, do get in touch and we can arrange it. We've allowed plenty of room in our timetable for this so please just ask - we want you to have as comfortable a visit as possible.